2014 was the year of FinTech, particularly in London. This is an area where I have been spending a huge amount of time for the last few years in both the US (NYC mainly) and London. 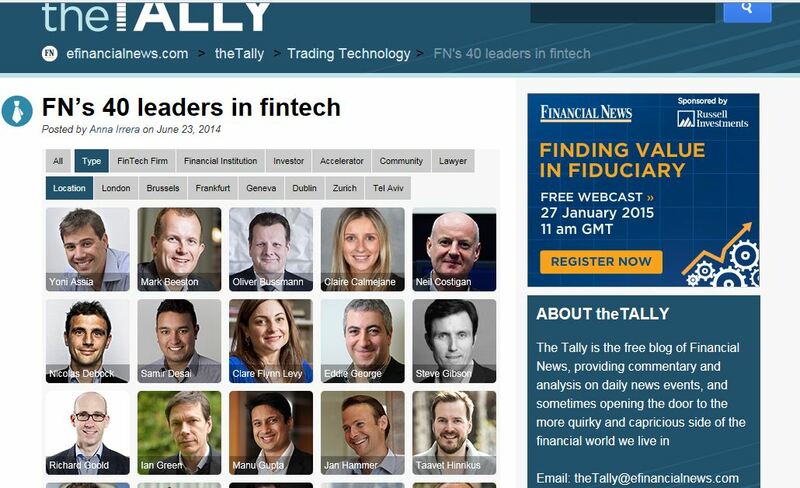 I was delighted to be included in Financial News’s first FinTech 40 list in the summer of 2014. The list makes for good reading and contains many friends, colleagues and clients whom I have huge respect for. If you are interested in FinTech, then this list is a good intro to the movers and shakers in EMEA and beyond (it’s not really a US list though). Previous Article Where Tech meets Law – day zero….